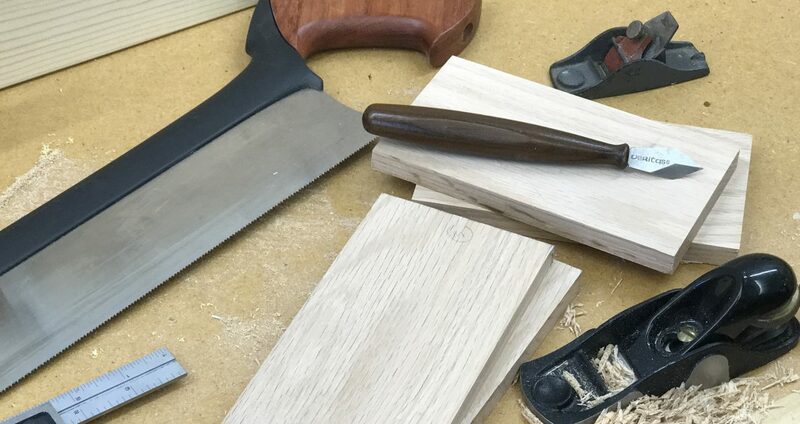 The first time I used a really, really sharp chisel and plane iron, I immediately became aware of how sharp tools can make or break craftsmanship. With a sharp tool, fine-tuning a joint or smoothing the surface of a workpiece becomes effortless and precise. When I first got serious about woodworking, all I knew about sharpening was that you were supposed to use a bench grinder. At least that’s what I grew up seeing my dad use. Oil stones were reserved for pocket knives. Then along came the Internet. I soon learned about the “scary sharp” method using wet/dry sandpaper. I was hooked. The tools for this method require nothing more than sheets of sandpaper and a flat surface. For years I used a polished wall tile I picked up at one of the big-box stores. It’s a 12″ x 12″ tile that’s perfect for holding a sheet of sandpaper. For touching up my chisels and plane irons, I’d start at about 400-grit and work my way up through 2000-grit. It’s a quick and relatively inexpensive method for sharpening edge tools. Then came the fad of using waterstones (oilstones are so messy and so “old school”). So I put away my “scary sharp” method in favor of a combination waterstone. I used it for a few years but soon discovered one drawback: Waterstones become dished out with use and require flattening. You can buy dedicated flattening stones, but I used 80-grit sandpaper on my 12″ x 12″ wall tile. It worked great, but can be messy. Then a friend of mine told me about the wonders of diamond stones, specifically the DMT DuoSharp dual-sided combination stones. Once I tried them, I was hooked. I rarely use any other sharpening method. I have the WM8CX and WM8EF models. This gives me a good range of grits from coarse to fine that serve the majority of my sharpening needs. Yes, they’re a little pricey, but well worth the investment. Here’s what I like about the DuoSharp stones. They’re flat and they stay flat. No need to mess with flattening them periodically. The steel plates that are coated with diamond grit are perforated. This means that when you spritz the stones with a little water before sharpening, the swarf doesn’t clog the stone. All it takes to clean the stones is a wipe with a cloth or running them under the tap and drying them thoroughly. The best thing I like about diamond stones is how quickly they cut. It doesn’t take much to get an edge. I proved this when I was chiseling out a lock mortise for a door jamb and hit a nail. After gritting my teeth in frustration at ruining a good chisel edge with a sizable ding, I drug out the diamond stones. I started with the coarsest grit and worked my way up through the finest grit. It took my all of about 10 minutes to get back to a “scary sharp” edge. If you’re one of those that has to work toward a mirror polish on your tools, you can invest in DMT DiaSharp Bench Stones. They’re available in grits as fine as 3 microns. You can view a chart of the available DMT grits by clicking here. So how do I know when a tool is sharp enough? My first test is to see if it will “catch” on my thumbnail as I try to drag it across. But the final test is to take a piece of basswood or soft pine and see if I can make thin shavings of the end grain. If I can’t, it’s back to the sharpening stones. If a tool is anything less than sharp, the fibers of the soft wood will crush rather than be severed cleanly. Posted on August 21, 2013 August 19, 2013 by Randy MaxeyPosted in Hand Planes, Hand Tools, Sharpening, WoodworkingTagged Chisels, craftsmanship, Hand Planes, Sharpening, Woodworking.